As seen in the Nobody Hikes in L.A. Guidebook! Location: Channel Islands National Park, off the Ventura coast. 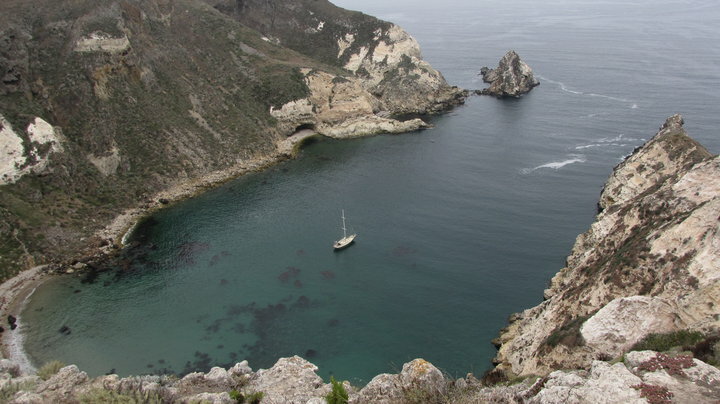 Island Packers is the main travel provider to the Channel Islands National Park. Visit their site here for schedules, fares and other information. Santa Cruz Island, at 96 square miles, is the largest land mass off the California coast. Only a quarter of the island is owned by the National Park Service, but that still gives hikers and campers plenty of real estate to explore. While the Channel Islands are notable for their lack of amenities (such as running water, trash collection and more), Santa Cruz is probably the most user-friendly of the bunch. There are shade trees, running water, and according to a reliable source, “the cleanest outhouses”. Still, check out the NPS website (link above) to make sure you know what you are getting yourself into. Santa Cruz has two access points. This loop trail leaves from the eastern harbor, Scorpion Anchorage (as opposed to Mid Santa Cruz, or Prisoner’s Harbor). The loop visits two of the most famous points on the eastern section of the island, Cavern Point and Potato Harbor. Take the trail to Cavern Point, heading past a “dairy cave” (carved out into the hillside, it was used to keep milk cold before the days of refrigeration. The trail climbs steeply up the hill, giving great views of Scorpion Harbor. If this first part of the trail seems a little difficult, it won’t last for long, as it tops out on the bluffs that you saw coming over on the boat. After about half a mile, you reach a broad, flat area where a short spur leads to Cavern Point. Here you get great views of the rest of the island. From there, follow the signed trail into the campground, heading south, and then take a sharp right and head west. The trail to the campground branches off; your route says straight, briefly dipping down and then climbing back up to the bluffs. To the left are the higher mountains of the island’s interior; on the right are more cliffside views. After about three quarters of a mile, the trail hooks up with the service road from the campground (the return route), and after another half mile, you reach a split. Bear to the right and follow a short spur to Potato Harbor, so named because from the air it seems to resemble a baked potato. You can, of course, retrace your steps back to Cavern Point, but for variety, you can take the service road down into the main campground. There are interesting, wind-carved sandstone formations on the side of the canyon, and at the bottom, you will get the only shade on the route from some eucalyptus trees. The trail leads out of the campground and back to the main area. If Santa Cruz Island lacks some of the dramatic cliffs of its currently inaccessible neighbor, Anacapa, it does offer a lot of interesting geology and topographical scenery. While Anacapa is pretty barren after the coreposis season (March – May typically), Santa Cruz is enjoyable year-round. Even on hot days, with adequate protection, you will probably be fine. This trip represents only the tip of the iceberg; if you enjoy the Potato Harbor trail there is plenty more to check out–plus Santa Rosa Island and the other three in the park. 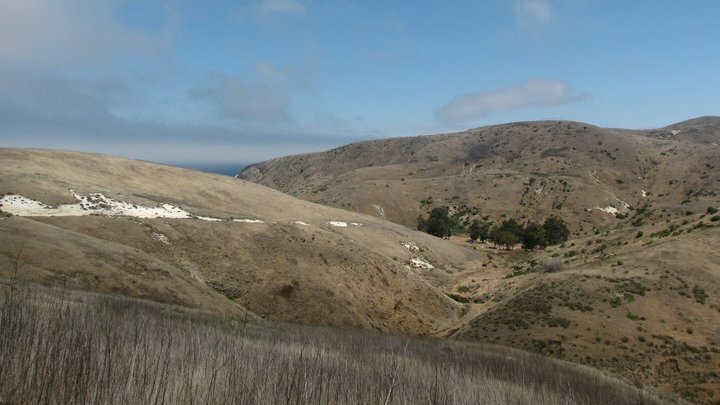 Who knows, this may even inspire you to explore the rugged back country of Catalina Island. Thanks for reading. We sure do have a lot of great hiking trails out here. Enjoy! I love this website. I would like to post a write up on a Hike in Grand Terrace, CA. Hiking up the Blue Mountain is a fun and challenging experience. There are three access points but only two open year round. There is an annual walk up the blue mountain with various sponsors. Hi Vince, thanks for reading, sorry about the late response getting back to you. We’d love to hear what you have to say about Blue Mountain, you can email a write-up to nobodyhikesinla@yahoo.com.